In the year 2019 Cheti Chand will be celebrated on the 7th of April. Sindhis celebrate the Cheti Chand festival to mark the beginning of the Hindu New Year for the Sindhi Hindus. Based on the lunar cycle of the lunisolar Hindu calendar, Cheti Chand is celebrated on the first day of the year and the Sindhi month of Chet. It is also known to the birth anniversary of Uderolal who took the form of a warrior and old man, called Jhulelal, who is also known to be the main deity among the Sindhi people. The day marks the arrival of Spring and harvest and is celebrated in a joyous manner with really fantastic food. It is also marked as an auspicious day for business, and it is the day when the new financial year begins. Sindis celebrate this day with mouth-watering sweet and savoury food items, and Cheti Chand is probably the best day to learn more about their traditional recipes. Cheti Chand 2019: Date, Significance & History; Here’s Everything You Should Know About Sindhi New Year. Authentic Sindhi Tahiri is prepared on the auspicious occasion of Cheti Chand. It is sweet rice preparation made for prasad for the Gods. The dish tastes great and is also easy to prepare. Another famous recipe from the Sindhi cuisine, this curry recipe includes Fresh cut vegetables that are cooked in tangy gram flour based curry. It is known to go perfect with steamed rice. 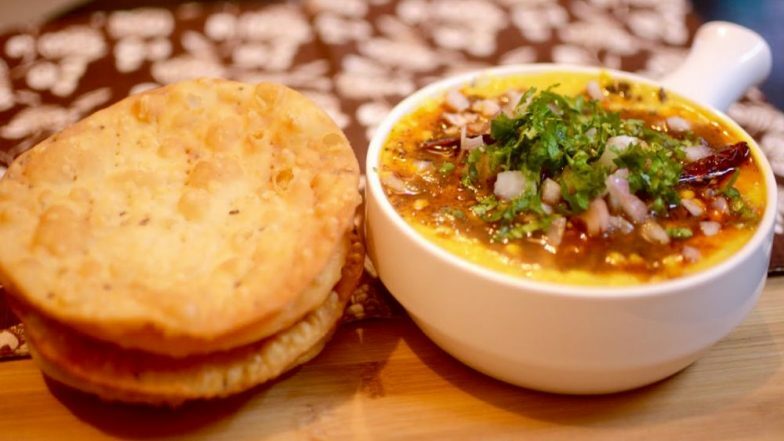 Dal Pakwan is a famous traditional Sindhi breakfast/snack recipe perfect for any occasion. With simple ingredients such as Split grams, all-purpose flour and a variety of spice, Dal Pakwan is a treat. This favourite breakfast recipe from the Sindhi cuisine is one of the tastiest savoury items you can try. It is best served with curd and is extremely popular. This delicious sweet dish is perfect to satiate your sweet tooth. Made out of unsweetened mawa, Sindhi Singhar Ji Mithai is an extremely popular Indian dessert. Indian festivities give us an opportunity to try out foods from different traditions, so make the most out of it and try Sindhi food on the occasion of Cheti Chand.